On March 13th we took The Children swimming. 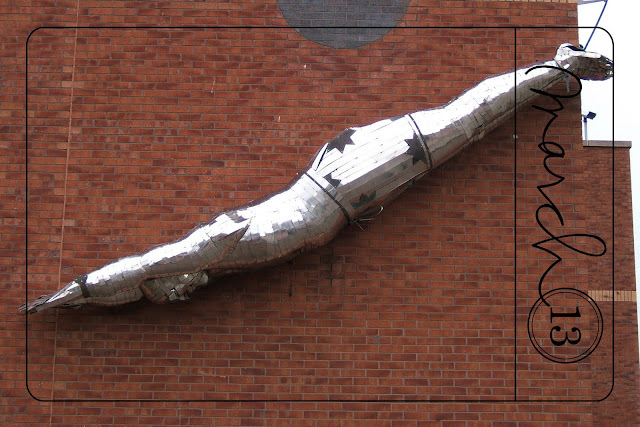 This sculpture is on the front of the building. That's a fun sculpture. I love his shorts with stars on! Oooooh I have to show the Muller rice to my Son Laurence - that used to be his favourite - they don't sell it here and it isn't the kind of thing family can send in their care packages, so he misses it a LOT!!! The tinned Ambrosia rice just isn't the same to him! Mmm, toffee Mullerice!! I like the apple strudel one! !